A proper catalogue raisonné entails many years of collaborative research. It seeks to resolve most, ideally all, uncertainties regarding a reproduced work of art’s attribution, dating, media, techniques, provenance, exhibition history and critical citations. Done well, such a publication may be counted the ultimate tribute to a living artist. Jasper Johns, now 88, had already enjoyed an abundance of tributes when the five-volume catalogue raisonné of his painting and sculpture appeared in 2016. The first such project of the Wildenstein Plattner Institute, a non-profit foundation in New York, it set the standards of design elegance, comprehensiveness and technical detail that inform the two additional complete Johns catalogues that have since appeared: one surveying his monotypes and the six volumes devoted to his drawings. These dozen volumes introduce even those who already know Johns’s art well to numerous works in various media seldom or never yet exhibited publicly, many still in the artist’s possession. Even for a reader casually perusing these luxurious books, the question arises repeatedly—unanswered by the authors—why Johns, a discerning collector, has chosen to keep close so many of his own works. The art historian, Roberta Bernstein, who has known Johns for 50 years and published extensively on his work, led a team of researchers on the painting and sculpture project. She also wrote the monograph that serves as the first volume of the catalogue raisonné. It traces a biographical arc, but gives priority to the progress of Johns’s art over incidents in his life. Although Johns has said many times that he does not want his work to be about himself, Bernstein’s account evokes a more ingenious, but also more emotionally burdened, artist than those unacquainted with him may see reflected in his art. Her analysis discovers fascinating aspects of disguise, appropriation and elusiveness in Johns’s imagery, materials, techniques and sources, while providing a taste of the frank, sometimes genial, yet enigmatic impression he makes in interviews and in person. 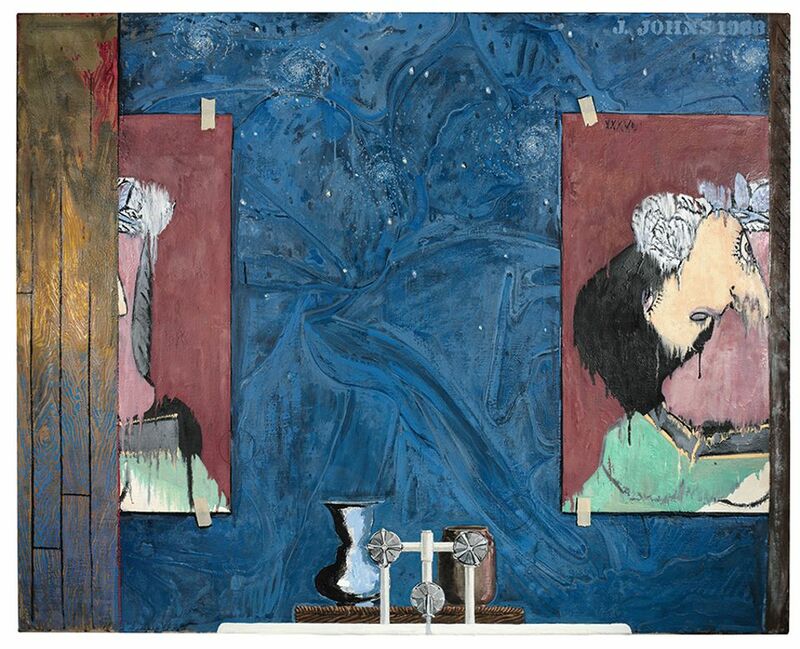 Johns made only three paintings in 1988, each of which presents Picasso’s Woman in a Straw Hat in combination with the Stony Point bathroom… All three of these works feature the blurred, disintegrating copy of Picasso’s portrait that Johns had first employed in 1987. The artist has related the manipulated image to two anecdotes, one of which recounts that Picasso, upon first seeing a painting by Willem de Kooning, made the offhand remark that it looked like a “melted Picasso”. Intrigued by this comment, Johns later connected it to a story by Jean Cocteau “that Picasso said he was always amazed, when he took a bath, that he didn’t melt like a cube of sugar”. According to Johns, “that image stuck in my mind, and I decided I wanted to use an image of a melted Picasso. Finally, I put it together with the bath.” The two larger works are a closely related pair of encaustic canvases identical in size, with light and dark-blue backgrounds, respectively. In each version, Picasso’s portrait is split into two sections and taped trompe l’oeil style to the wall. The cropping creates uncertainty as to whether the picture is repeated or divided into two parts that, if scrolled, would reunite into a whole... By locating the bathtub directly in the centre of the composition, the gaze of the artist falls on the area between the pictures, which is filled with the traced outlines of [Mathias] Grünewald’s diseased creature. In both paintings, the background is peppered with dots; the dark-blue version includes spiraling galaxies throughout the upper register. These additions transform the space from a flat surface into an infinitely receding view of the cosmos, with Grünewald’s figure as a constellation in a star-filled sky. The compositional suggestion that a stretched canvas might be scrolled into a tube connecting opposite edges occurs in several of Johns’s works, as Bernstein notes, but she never provides a satisfactory clue to its origin or meaning. But the art historian Jennifer Roberts, co-author with Susan Dackerman of the monotypes catalogue raisonné, may have hit upon it, without saying as much. Roberts places Johns's monotypes in the context, well defined in Bernstein’s study, of works such as Device (1959) and Fool’s House (1961-62), in which Johns appeared to delegate a painting's execution partly to extraneous, if symbolic, objects, such as a ruler or broom.